Do you have a favourite children's picture book? At our house we love the Fern Hollow series. 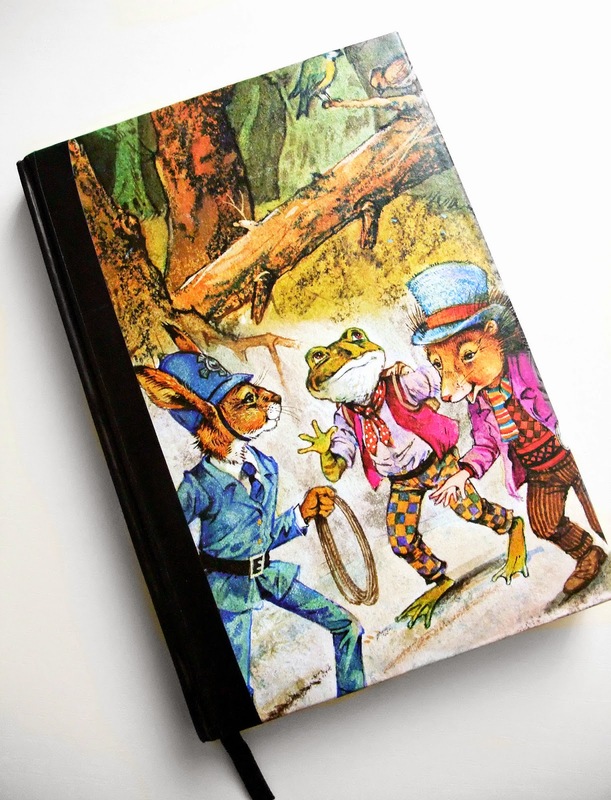 I've always been a major sucker for books which feature frogs dressed in striped britches and ducks getting around in bonnets that tie up in big bows under their chins. O, to live in that world! It is certainly a far cry from the red-neck Wonderland in which I currently reside. We used to see these books at local op shops quite frequently (though sadly, less often now) and always snapped them up. But, in our Fern Hollow-buying- frenzy, we have inevitably ended up with more than one of some books. I need a new ideas notebook, and as I love, love, LOVE those pictures, I managed to convince a very (very!) reluctant Cameron to part with one of his doubles so that I can cover my new journal in some of its pages. You may well point your finger at me and shout 'Sacrilege! Books are precious!' But this particular book had seen better days. The pages were falling away from the spine and some of those pages had been scribbled on. And I keep my notebooks forever, so it will, in part at least, live on. My lovely husband bought me a three buck notebook (and a cappucino!) on our last jaunt to Officeworks. I selected a couple of choice pages from Cameron's book, covered them with Clag and glued them to the cover of the notebook. Then I used black insulation tape to cover up the red spine. - so there's no mistaking who it belongs to. This would make a great gift for a friend, or perhaps your child's teacher, and can be made a very personal gift if you can find out what the recipient's own favourite picture book was as a child (and if you are able to get a copy of it!) Golden Books stories are classics (everyone has a favourite one of those), and you can pick new editions up quite cheaply at bookstores. I will update with the finishing touches in a later post, and perhaps do a tutorial with a bit more detail if there are any requests for one (not that you crafty types would need one). Happy weekend to everyone! I'd LOVE to see a tutorial. I have been scooping up de-accessioned kid's books at library sales and other than using the covers (saw an idea on Pinterest to create a wall hanging) and possibly the pages as envelopes, I'd love more ideas on how to use them. Thanks!